It still necessary to update the screenshots on the Export guide, but it might be good enough for today. I got a lot more in mind, like to write a tutorial on how to create custom projects workspaces, to work with your mod projects. and that would comes in addition to complete the The Installation Guide. I would like to record a new time the video tutorial about the installation, and instead of one tutorial , i will split the process in two videos, the first would be dedicated to MESA Setup, and a second one for the Project Setup. And the most important, is that i must to make a Guide about the Characterization. As reminder this feature help you to compile a npc character or a player character(third person model) using the npc animation set and the player animation set from the human sdk provides with the sourceSDK content. The human sdk is included with MESA 2.1 and is located into ” MESA/addons/human_sdk“. 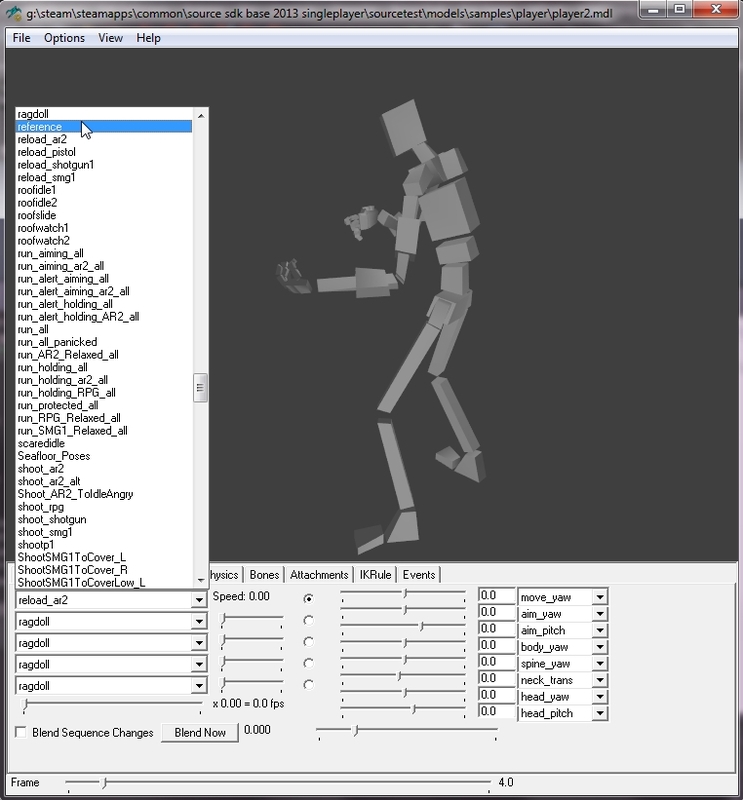 Unfortunately, i don’t provide the reference biped in rest posture, but I am working on sort of Sample Projects, from the one you could check out on you own, how the scenes are structured, you could simply copy the samples scenes into your own project workspace then using this Characterization feature. SMD IMPORT : Rewrite of the ReadUntil function in use when you importing a SMD file into maya. SMD IMPORT : Import Reference, no longer force maya to create a new scene when importing an SMD file. SMD IMPORT : Mouse Cursor don’t flick anymore during the SMD importing process. INSTALL/CONFIG : Simplification of Mesa_config.bat file, the simplification has been apply to every projects batchs files too. SMD IMPORT (ref) : weight skin data greatly improved during the smd reference import in maya. SMD IMPORT (ref) : very small skin value are pruned at the import process. SMD IMPORT (seq) : don’t need anymore to rename the unknowdag1 object to “unknowdag”, let it with the default name,the smd sequence will stop to throw you the error message about the missing unknowdag object. COMPILE LOG : a printed information that bring confusion with a suspicious double quotation at the beginning of the path of studioMDL Compilation and VTEX. 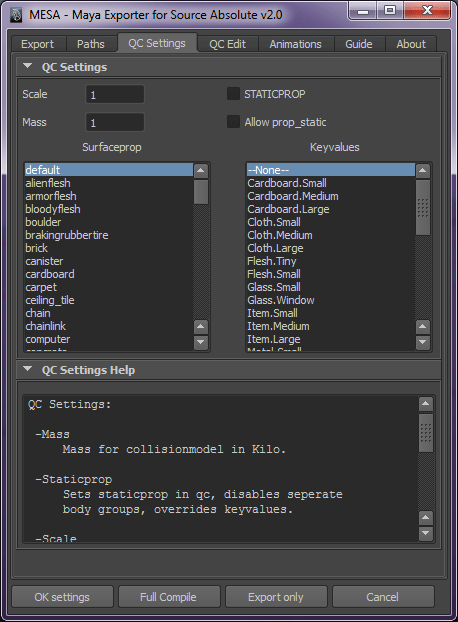 SAMPLE ASSETs : adding some samples ready to use with maya and to compile with your game projects. 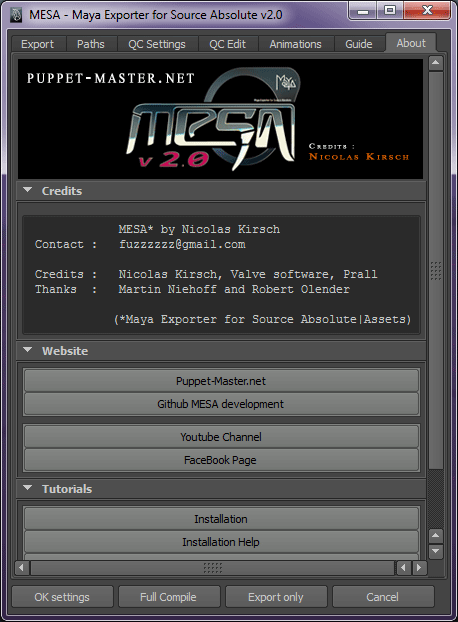 You can download MESA from the Download page, or you can download MESA from Github. If you get in trouble with the new build of MESA, you can report the bugs/issues on that topic. Yeah long time since i had posted anything here, thing hasn’t happened as expected, well i hope to be a little bit . I have posted a tutorial for Unreal Engine 4 , Create an engine plugin using blankplugin. Mesa 2.1 has been released i still haven’t posted anything about it, but i will even if it will make more sense to post that news at the moment i had posted that on Github. I also had added a link to get mesa directly from this server a not github. Far from me the concept of promote any industry brand, because it necessary that a wide range of brand actively develops things and product, and this is the main of the industry and how we progress with the technology around us. Well I Had some hard time with source engine, with this last year of development, it hasn’t been the best year of my life, for project like Jurassic life ( read the detail here for the ones that are interested) , and other and life thingies, well. Motivation for game development is not a problem, all is in place, but it seems that it’s a good while to discovers new things, change you habits, get some pleasure to write a new page of your book life… It would not have been possible to continue to work with the source Engine, Valve do not informs the community of developers, who work on their Game engine, I can’r to expect what the future will be made with. That pretty annoying for people like me, when you are entirely lost and are not sure where heading on.and that finally i realized that you had n’t moved an inch . That the moment to change your mind..
Hello World ! I’m still alive, just an..
… harder time with project and life stuffs. I would d like to apologize about the lack of update, and the unfinished guide for Dota 2. I would like to inform the MESA users that a last maintenance will be provide and BUT Mesa is DISCONTINUED, because I am moving up to new horizon in game development and i want to work with Engine that reflect the current technology in game industry, so I am sorry to leave MESA user without any support for the source engine. But you can still Post your help Topic into the forum, you probably noticed that i am very slow to respond with the question there are posted, happily with the wade number of people who download mesa 2.0.1 everyday, it seem that the installation system has successfully made their effect, as the question are most commonly about the setup and the basic usage. 1. Re-localization of source sdk in Common directory. 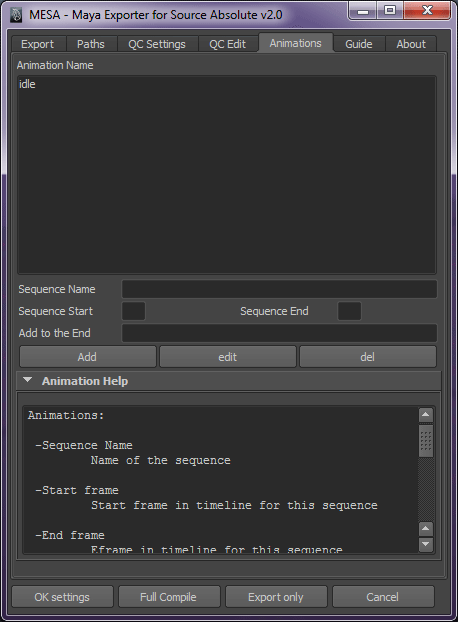 2. adding import in Existent scene. So you could import a full collection set for your characters and the Valve workshop. MESA has been updated, with many fixed bugs. Various Projects Batches syntax and paths errors. 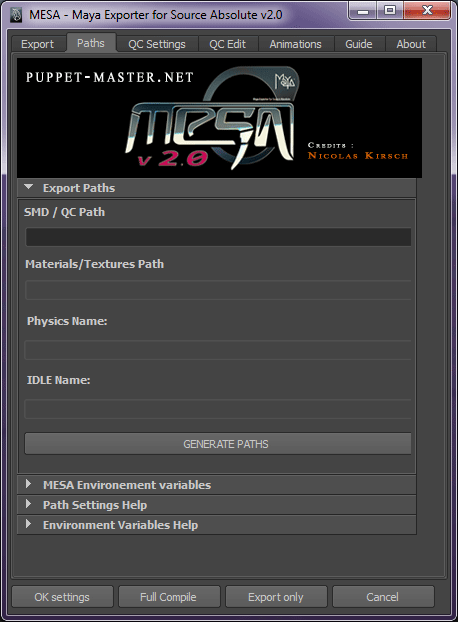 You can download MESA v2.01 from the download page. 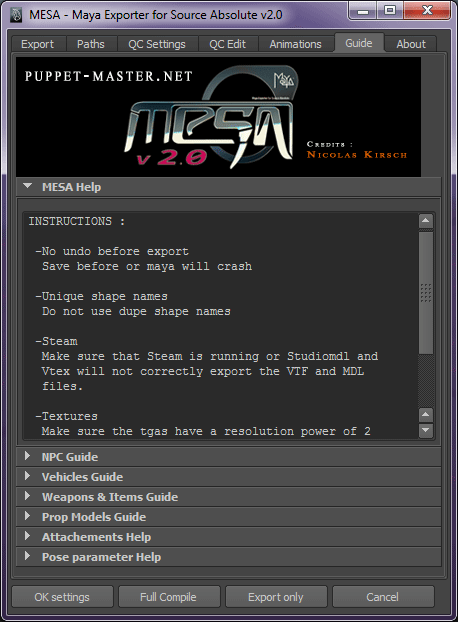 MESA is a tool-set of scripts for Autodesk Maya that can Import and Export to the Source engine. This is a list of the new functionalities and improvements than MESA 2.0 brings. The new environment System is now completely independent from the Source Sdk Environment variables. 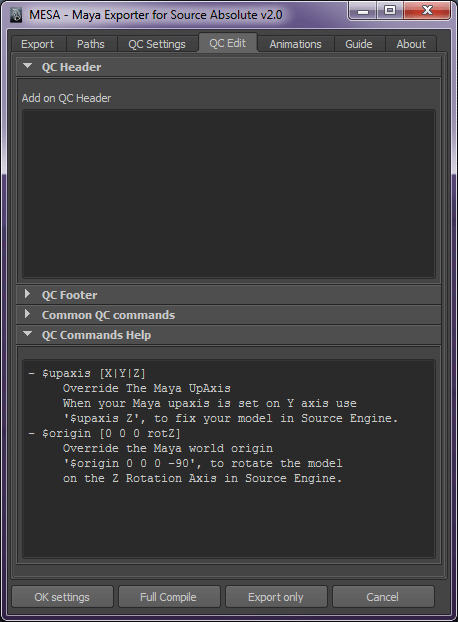 The Maya.env files is no longer used to define the environment variables that MESA requires to work. 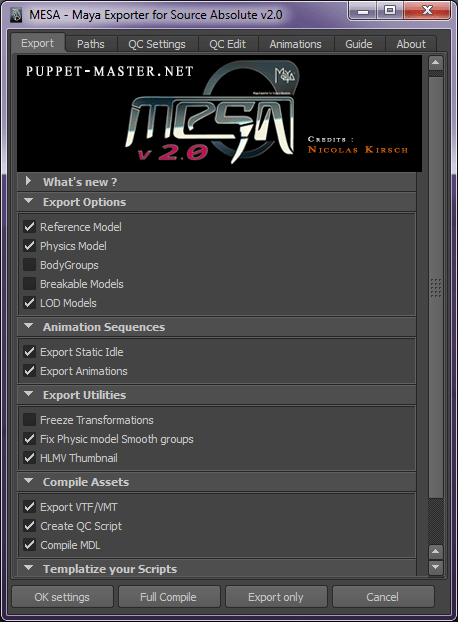 MESA provides the project environment workspaces for the 20 Games powered by the Source Engine. with the creation of assets vehicles, npcs, items, and weapons. You can use the Issue report service that Github offers for developpers to report any bug, or features requests. Click on the Logo ! and check the main menu for all the detail, lot of documentation and Video tutorials.